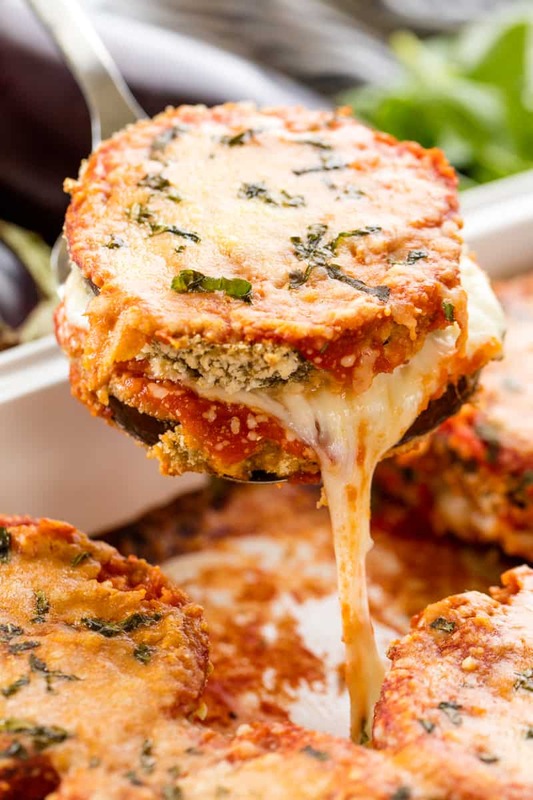 Delicious Baked Eggplant Parmesan with crispy coated eggplant slices smothered in cheese and marinara. Eggplant parmesan tastes very similar to regular chicken parmesan. People often wonder what flavor the eggplant itself lends the dish.Eggplant has a very mild flavor, like spaghetti squash. Because it has such a mild flavor, it’s easily used in recipes that have bold flavors. In something like eggplant parmesan, the eggplant flavor itself isn’t even really tasted. HOW THICK DO YOU CUT EGGPLANT FOR EGGPLANT PARMESAN? Eggplant should be sliced about 1/4 inch thick when making eggplant parmesan. Simply cut off the end and slice into large, 1/4-inch thick circles. The peel of an eggplant is completely edible. However, as the eggplant grows bigger and matures, the peel may become tough and bitter. People often prefer to peel larger eggplants because of this, but smaller eggplants do just fine unpeeled. It ends up being a matter of personal preference. Slice eggplant into ¼ inch rounds. Lay out in a single layer on a paper towel lined baking sheet and sprinkle with salt. Let sit 1 hour to release moisture. Preheat oven to 400 degrees F. Lightly grease a large baking sheet. Set up 3 shallow dishes for dredging. In the first dish, stir together flour, salt and pepper. In the second dish, whisk eggs. In the third dish, stir together panko bread crumbs, Italian bread crumbs, and garlic powder. Working one at a time, dredge eggplant slices in flour mixture, dip in egg mixture, and then coat in bread crumb mixture. Place onto the prepared baking sheet in an even layer. Sprinkle on a light coating of parmesan cheese. Roast in the preheated oven for 20 minutes, flipping eggplant slices halfway through. Spread 2 tablespoons of marinara into the bottom of a lightly greased 9x13 dish. Layer half of the eggplant slices onto the bottom. Top with half of the remaining marinara, and then layer on all of the mozzarella slices. Sprinkle on half of the basil and half of the parmesan cheese. 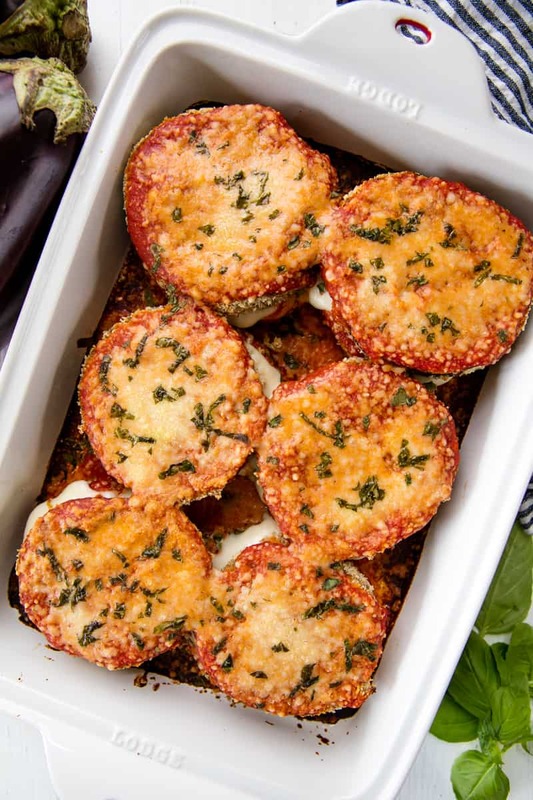 Place remaining eggplant slices on top and cover with remaining marinara, basil, and parmesan cheese. Bake, uncovered, in the 400 degree oven for 20-25 minutes until cheese is melted and the top is bubbling and lightly browned. 0 Response to "BEST BAKED EGGPLANT PARMESAN"